A Compile Heart x Dengeki Bunko x Dengeki PlayStation collaboration. Compile Heart announced Kangokutou Mary Skelter for PS Vita during the Dengeki Game Festival today. The game, a 3D “active dungeon RPG,” is a collaboration between Compile Heart, Dengeki Bunko, and Dengeki PlayStation. The story is written by Yomoji Otono and character design is by Kei Nanameda. Dengeki Bunko will publish a novel based on the title, and Dengeki PlayStation will begin serializing a prequel starting April 14. 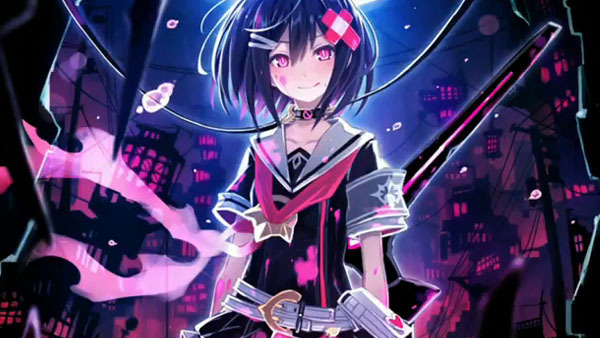 Mary Skelter is set in Japan. In September 1999, a living prison, Jail, suddenly appeared, and submerged a great city 666 meters underground, and went on developing. As a result of Jail’s birth came the appearance of monsters known as “Marchen,” who began seizing and imprisoning humans. The protagonist and heroine were born several decades after this incident and aim to escape the jail in which they were confined. The living jail possess three great desires by which it grows: appetite, sexual desire, and the desire for sleep. To escape above ground, you must grow the jail more than 666 meters. The town is imprisoned in jail, and several girls are born after the humans are imprisoned by the Marchen. For some reason, these girls react to the Marchen’s blood and their physical abilities greatly increase, and they form the “Chishiki Girls Squad” in order to plan a jailbreak. This group consists of Akazuki (Little Red Riding Hood), Oyayubihime (Thumbelina), Shirayukihime (Snow White), Nemurihime (Sleeping Beauty), and so on—all members that don the name of fairy-tale heroines. Jack – The protagonist. He’s a little timid, but he takes action when the situation calls for it. Alice (voiced by Sumire Uesaka) – A girl imprisoned together with Jack. The two provide each other mutual support. Akazukin (Little Red Riding Hood) – An older sister-type who breaks Jack and Alice out of Prison. She saves them because they both possess a special power. The pink blood that Marchen bleed in battle are involved with the game’s battles, dungeons, and training. In dungeons, there are puzzle-solving elements that involve using items like bows and arrows, bombs, and such. One particularly panic-inducing part of exploring dungeons is when the Merchen boss, “Nightmare,” appears. Nightmare disregards the general ‘one turn, one move’ rule and chases you in real time. More information is due out in the March 31 issue of Dengeki PlayStation.